14th November every year in India is celebrated as "Children's Day" commemorating birthday of Pandit Jawaharlal Nehru. He was the first Prime Minister of India after independence. His concern for the welfare of children was such that he was popularly known as "Chacha Nehru" (Uncle Nehru) among his little admirers. Historic Day - Concern : On this great occassion while remembering this day which marked a new beginning in the understanding of our solar system and cosmos. Importantly today is the day when Indian Flag was planted on the surface of moon for first time in Indian History. It is unfortunate that not many remember the lost science soldier (Chandrayaan I) of the country or its historic probe which found first direct evidence of water on moon. Yes today is the day when in year 2008 The Moon Impact Probe (MIP) a lunar probe developed by the Indian Space Research Organisation (ISRO) was released by ISRO's Chandrayaan-1 lunar remote sensing orbiter on to the surface of moon. 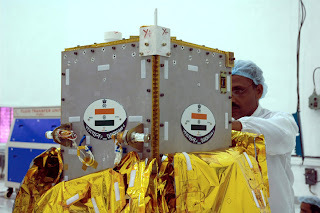 The Moon Impact Probe separated from the moon-orbiting Chandrayaan-1 on 14 November 2008, 20:06 and crashed, as planned, into the lunar south pole after a controlled descent. The MIP struck the Shackleton Crater at 20:31 on 14 November 2008 releasing underground debris that could be analyzed by the orbiter for presence of water/ice. Interestingly MIP carried Indian Flag etched onto it to the surface of moon. Further the MIP release on 14th Nov was an attempt by ISRO to inspire future scientists of the country. KINDLY CLICK HERE TO SEE OUR ARTICLE WITH FIRST IMAGES OF MIP - NOVEMBER 2009. One among Five nations to reach lunar surface : With this mission, India became the fifth entity to reach the lunar surface. Other entities to have done so are the former Soviet Union, the United States, the European Space Agency (currently owned by 18 member nations) and Japan.